Of the Bihar's six seats reserved for Scheduled Castes or Dalits, the LJP will contest three and the JD(U) two, leaving just one for the BJP. Patna: Bihar Chief Minister Nitish Kumar has done as an ally what he could not do as a political rival: Block the efforts of the Bharatiya Janata Party (BJP) to emerge as a major political force among the Extremely Backward Classes (EBCs) and Dalits. The BJP-led National Democratic Alliance (NDA) announced the contours of its seat-sharing agreement for the 40 Lok Sabha constituencies in Bihar Sunday. While the BJP and Nitish’s Janata Dal (United) will contest 17 seats each, the Lok Janshakti Party (LJP) of Ram Vilas Paswan has six. Of the state’s six seats reserved for the Scheduled Castes or Dalits, the LJP will contest three and the JD(U) two, leaving just one for the BJP, which is largely seen as a party of the upper caste, urban voter. 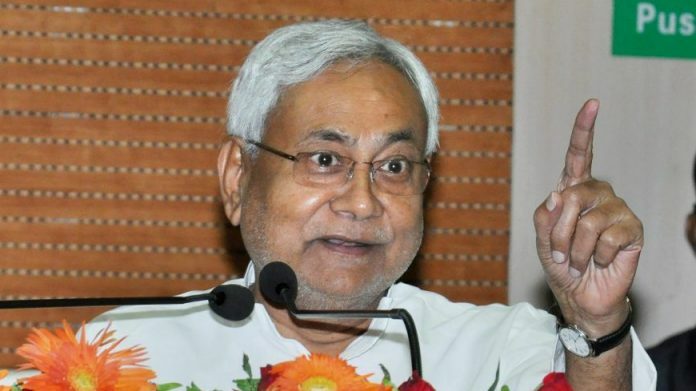 “Through the seat-sharing pact, Nitish has ensured we are back to square one — a party of Baniyas and upper castes,” a BJP member of the Bihar legislative council, the upper house of the state legislature, told ThePrint. “Out of the 17 seats given to us, we will be fielding nine candidates from the upper castes,” the member added, stressing that the BJP’s quest to make inroads among EBCs (a subgroup of Other Backward Classes that includes the influential Kushwaha community) and Dalits had taken a hit. Over the past few years, the BJP has tried to court members of the Kushwaha caste, who account for 6 to 8 per cent of the state’s population. From 2015, the year of the previous assembly election in Bihar, it has propagated the belief that the Mauryan king Ashoka was a Kushwaha, and celebrated his birth anniversary despite the assertion of eminent historians that no ancient text mentioned either his caste or his birth date. The BJP was confident enough about its outreach efforts to let former ally Upendra Kushwaha of the Rashtriya Lok Samta Party — which won all three seats it contested in 2014 — switch sides to the Congress-Rashtriya Janata Dal (RJD)-led Grand Alliance. The seat-sharing agreement leaves the BJP with no seats to field a Kushwaha. Where it wished to field Kushwaha face Samrat Choudhary from the Khagaria parliamentary seat, the effort was stalled by Nitish. The constituency has now been given to the LJP. Until the mid-1990s, the BJP was a marginal player in Bihar. In the 1995 assembly polls, it unseated the Congress as the major opposition party, primarily due to its performance in areas that now fall in Jharkhand. Even then, it was considered an urban-centric party, and its campaign posters and banners would disappear as you exited cities. Its growth in Bihar came after it launched an alliance with the Samta Party, led by George Fernandes as well as Nitish Kumar. The parties were soon eating into RJD chief Lalu Prasad’s vote share, and the BJP began to court greater acceptability among the backward classes and EBCs. In both the 2005 and 2009 assembly polls, the BJP won seats where analysts believed it had no base. With the BJP part of the ruling alliance, the influence of the Rashtriya Swayamsevak Sangh (RSS) grew as well, and the number of shakhas reportedly increased from 600 in 2005 to 1,500 in 2014. The presence of all BJP ministers of the Nitish government in the Sangh uniform at an RSS drill in 2009 was symbolic of the party’s spread with the active participation of the RSS. The decision of the Congress to back Lalu Prasad after the 2000 assembly polls aided the BJP’s identification as a party for upper castes. However, by 2014, the BJP seemed to have established a much wider appeal, with its win in 22 seats indicating that it also had the support of a major chunk of EBCs and Dalits, who had earlier been in Nitish’s fold. “Even in the 2015 assembly election, we contested just two-third of the 243 seats but got more than 24 per cent of the votes on our own and the average number of votes per assembly seat was 60,000 [for the BJP],” said a senior BJP leader. “It was an achievement we could have built on had Nitish not rejoined us,” the leader added. The BJP conceded several of Nitish’s demands because it was keen to have the JD(U) on its side this election. Its frustration stems from the fact that it has had to yield reserved seats it won in the 2014 election, when it emerged as the biggest player in the state while the JD(U) won just two seats. The parties had contested that election as rivals, though the LJP was part of the NDA then. The BJP’s efforts to remain a major player for the EBC votes — a group of 150-odd castes that contribute around 29 per cent of the state’s voters — has also taken a beating. For example, it has had to concede the Jhanjharpur parliamentary seat, where EBCs have a major say, to the JD(U). The BJP will now field only two EBC candidates, while the JD(U) can nominate more than two. Even in the Seemanchal area, where the BJP won three of four seats in 2014 due to EBC support, it has been given just one seat.